Suga, Yutaka. 2013. Atarashii no no gakumon no jidai e – chishiki seisan to shakai jissen wo tsunagu tame ni.Iwanami Shoten. Suga Yutaka, professor of Japanese folklore at the University of Tokyo, calls for a reflexive, inclusive, and reciprocal mode of field research in disaster sites. He argues that researchers who embed themselves in a disaster site must be conscious of how its inhabitants are especially vulnerable to power imbalances when interacting with outsiders authorized to extract data from their lives. 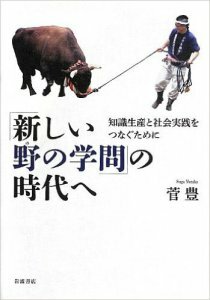 This is a three-part auto-ethnography that contextualizes and analyzes Suga’s relationship to his field of Ojiya City in Niigata Prefecture, where he studied the ritual of bull-fighting in contemporary life. Part I discusses how his work transformed after the 2004 Chūetsu earthquake to include relief work and community-rebuilding efforts, which changed his relationship with the residents. Part II critiques the state of folklore studies in Japan for increasingly drifting toward a “public-sector” mode of scholarship where academic elitism overshadows folklore’s roots in socially inclusive activism. Part III assesses a growing movement that he calls “new field learning”, which actively attempts to collaborate with non-academic experts in knowledge production instead of relying on academic elites. Suga’s personal experiences have wider implications for disaster studies. Echoing his other reformist colleagues, he eloquently argues against the increasing instrumentalization of disaster site fieldwork, which he sees as an originally humanist endeavor, for academic institutions. His insights have direct relevance for researchers in Fukushima post-3.11, and for researchers from any discipline conducting disaster fieldwork. The concise prologue and conclusion also provide guidelines on how to build meaningful, committed relationships with disaster field sites.